I purchased the Veritas Planing Stop from Lee Valley (http://www.leevalley.com/US/wood/page.aspx?p=69837&cat=1,41637) about a month ago. I’d had a planing stop I made myself, but I managed to crack it, so I decided to give this one a try. The stop is about 10 in wide and a little over 1 in deep. It has 2 metal posts that fit into standard 3/4 in dog holes on your workbench. The posts slide along the bottom of the stop in a T track. I have dog holes in 2 patterns on my bench: parallel to the front along the middle and left and perpendicular to the front on the right side. I’ve used this stop in both patterns and it’s worked great. I’ve planed boards up to 2 in thick and down to 1/4 in thick and not hit the stop once. I’ve used it by itself and with the board cinched between the stop and a dog in my front vise. It works just fine either way, though I prefer with the board cinched. This is the sort of accessory that you can make yourself, but if you have the money and inclination, I’d strongly recommend this stop. The ease of adjusting the posts to suit your dog holes and its overall functionality make it well worth the money. I never cared for planing stops. The resistance is at the front and can result in your work ‘pivoting’ during planing. Try a few cams that you can make in ten fifteen minutes or less. The cams pinch your work from the sides toward the back and results in almost no chance of ‘pivoting’. I just watched the video and couldn’t believe how much the “clamped” board he was working on was jumping around , and he is using two of the stops. I’ve not had any problems with the board jumping around on me, whether clamped on the opposite end or not. I’ve only got one of the stops. Not sure what he was doing wrong. Are you safer with something wood or plastic? This looks like metal. If it were me, though, I would probably just opt to make my own. It is made of aluminum I believe. If you were to hit it with your plane, you’d ding the blade. It’s very short though, less than 1/4”. If you needed to plane something really thin, you could shim the board with something I suppose. I did make my own and managed to crack it, so something sturdier like this made sense to me. I also have 2 different patterns of dog holes. If I made my own, I’d either have to make it adjustable, and most likely less sturdy, or make more than 1. I’m running out of room as it is. Seems like a good old fashion bench hook would do the same thing ? A bench hook does the same sort of thing, but at least with my workbench layout, this provides support for planing much longer pieces than a bench hook wood, unless I made a very long bench hook. The one I have is around a foot deep, so that’s about how long a piece it will support. I fail to see any ‘operator error’ in the LV video. The board he’s planing isn’t really jumping around. It’s moving a little when he brings the plane off the board for the next pass. 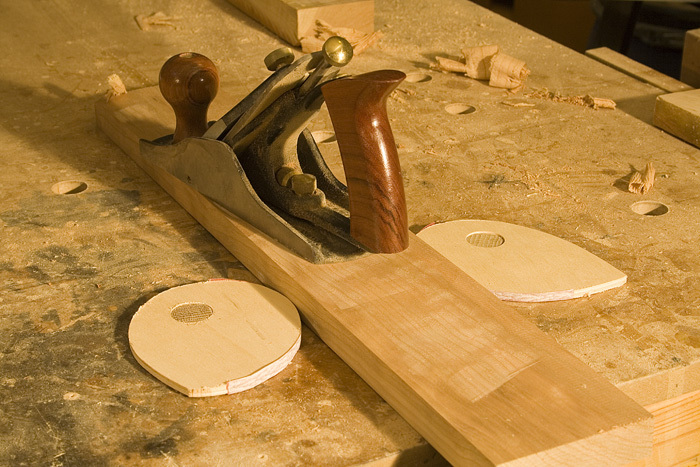 It’s not clamped; it’s held between 2 of these stops forming a kind of “L” shape. Some movement should be expected in that case. I only have 1 stop, so I never use this configuration.